Figures provided to CIC News by the BC PNP show the majority of these nominations 1,999 were issued through the Express Entry BC Skilled worker category.Another 936 nominations were issued through the international Graduate Category and 165 went Express Entry candidates through the international post graduate category. A job offer is not required in order to receive a nomination through the EEBC: International Post-Graduate category, which is open to international graduates of eligible B.C. institutions who have obtained a master’s or doctoral degree . International Graduate categories are required to register via the province’s points-based in addition to Express Entry profile submission . Employers who are interested to issue job offer for foreign skilled worker, must satisfy BC regulations and requirements. These so-called “base nomination” streams issued 3,339 nominations in 2018, of which 1,699 went to candidates in the Skilled worker category . 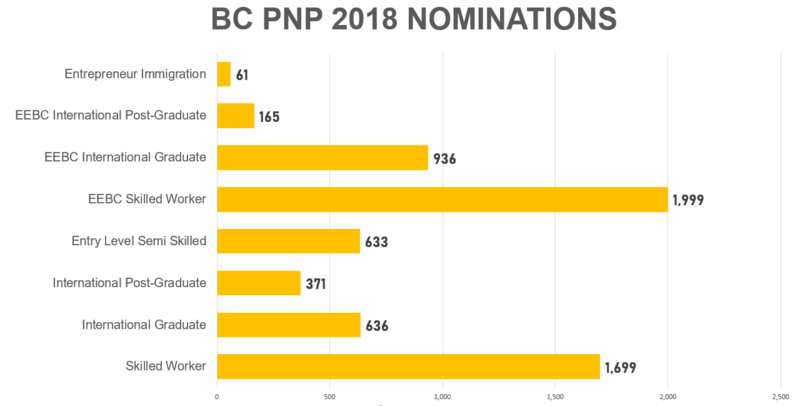 Another 61 nominations were issued through the BC PNP’s Entrepreneur Immigration Stream.